Ocean's 8 delivers exactly what it promises, a breezy heist flick loaded with glamour and star power. Fans of the Steven Soderbergh Ocean's trilogy will embrace the girl powered remake. It's a near facsimile of the 2001 ensemble with some of the original cast sprinkled throughout as cameos. Director/writer Gary Ross knows he's playing with house money. The previous films have a proven style that is duplicated en masse here. The key is having strong enough players with the personality to pull off the light fare. Sandra Bullock, Cate Blanchett, Anne Hathaway, and Sarah Paulson are a dream team of headliners. These women have enough acting awards to mint their own gold. Sandra Bullock stars as Debbie Ocean, the sister of Danny Ocean (George Clooney). She's just been paroled after five years in prison. Debbie used her time behind bars to plan the greatest heist of all time. Robbing the lavish Met Gala in New York City, and getting some sweet revenge in the process. Debbie recruits an all-star gang of thieves to do the job. Cate Blanchett co-stars as her ice water in the veins former partner. Mindy Kaling plays a jewelry expert dying to get away from her oppressive mother. Pop superstar Rihanna is dreadlocked and low key as a genius computer hacker. Awkwafina has the quickest hands on the streets. Sarah Paulson is a fence moonlighting as a suburban mom. Helena Bonham Carter rounds out the team as an out of vogue designer in massive debt. The ladies must expertly dupe an A-list actress (Anne Hathaway) into being an unwitting accomplice. 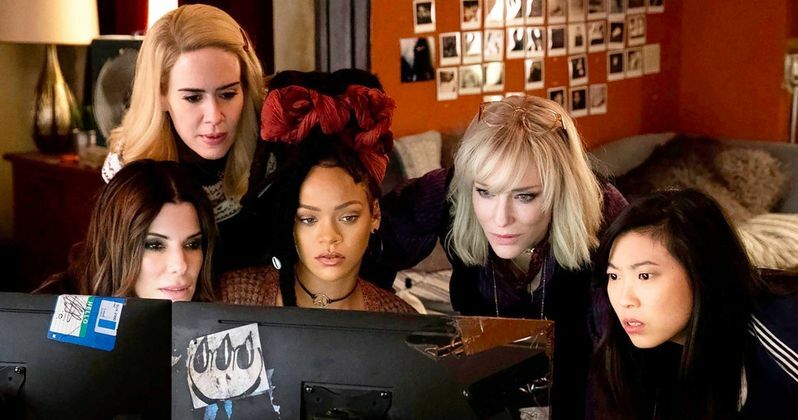 Ocean's 8 success hinges entirely on cast chemistry. Garry Ross knocked it out of the park with this ensemble. Each actress brings a distinct flavor to their role. Sandra Bullock is essentially the ringmaster in a circus of confidence women. She gets the most attention as the lead, but is pretty much a set-up woman for her talented colleagues. They will all charm the hell out of you. You can't help but root for the larcenous ladies. Sarah Paulson, one of the finest character actresses in Hollywood, stands out as Tammy. Her double duty as doting mom/criminal mastermind is hilarious. Paulson normally does intensely dramatic work. It's a joy seeing her do comedy with finesse. One behind the camera contributor must be noted for her excellence, costume and wardrobe designer Sarah Edwards (Masterminds, The Secret Life of Walter Mitty). Edwards had the arduous task of not only dressing each character distinctively, but all of the famous extras at the Met Gala. This is a gargantuan feat once you see the film. The Met Gala is the event of the year in fashion. There must be hundreds of individually tailored costumes in these pivotal scenes. Edwards is the clear early favorite for every costume award. The rub with Ocean's 8 is the utter lack of conflict. There is an antagonist, but he ends up being the easiest patsy of all. There isn't a second of this film where you feel the plan is in jeopardy. It's smooth sailing from the first frame to the last. Normally I would trash a film so fluid, but it's par for the Ocean's course. Every film in the franchise plays out in a similar way. The goal is to accentuate the cool characters, their fabulous frocks, and clever than everyone else criminality. Ocean's 8 is pure candy in this regard. Gary Ross stays within the lines and it works, most of the time. From Warner Bros. pictures, Ocean's 8 is the Mimosa at this summer's box office brunch. It's light, sweet, and mildly refreshing. I suppose an edgier film would be critically better, but enough darkness pervades pop cinema. A frilly heist at the Met is a welcome respite.